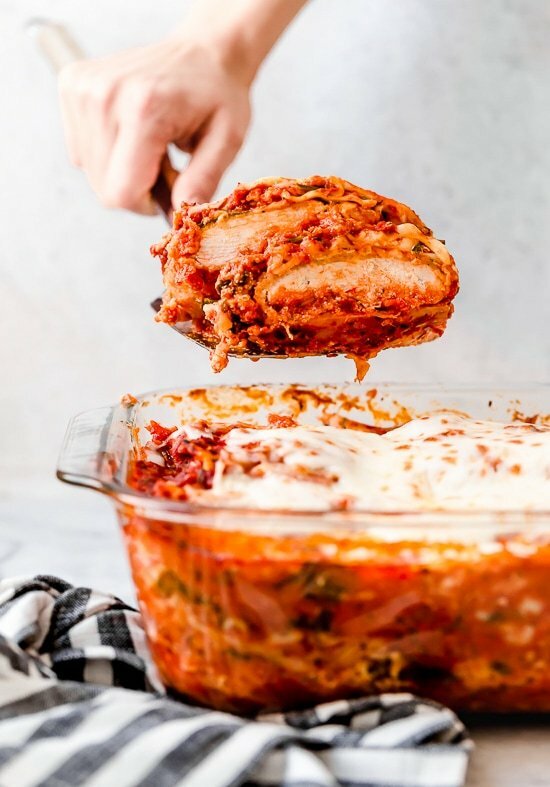 I partnered with Pyrex to create this mouthwatering dish in their new line of baking dishes Pyrex Deep which are up to 50% deeper which means there’s room for more layers! On Sundays, I love having my family over for dinner. I usually get together with my Mom, brother, sister in law and my nieces, sometimes my aunt, uncle and cousins come too. I made this dish last night, and my family loved it! I assembled everything ahead and popped it in the oven when they came, which gave me more time to spend with them instead of in the kitchen. Portions here are very generous! I served this with a big tossed salad and dinner was done. 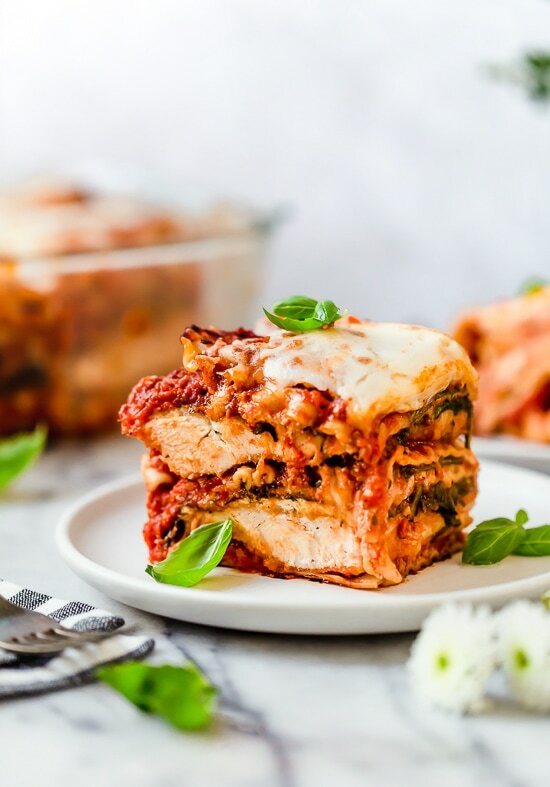 This tastes great for leftovers for lunch or dinner the next day. 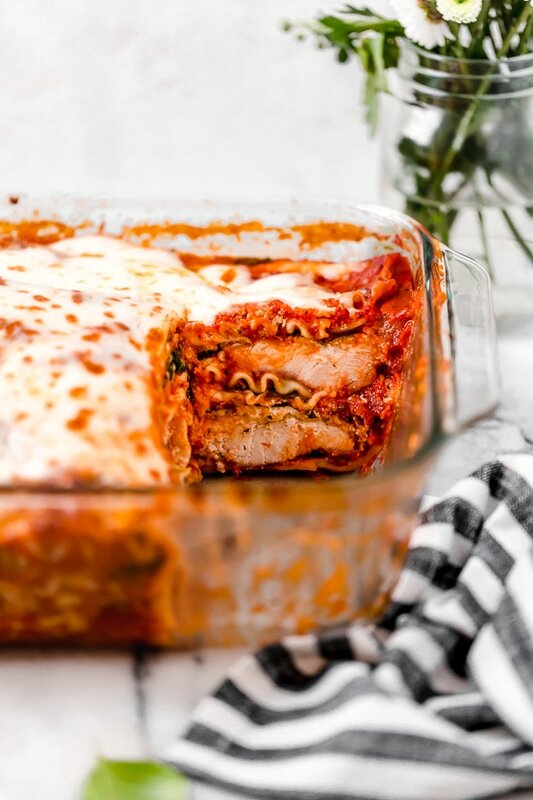 If you wish to bake and freeze, this would make a great freezer meal. Simply cut it into portions once it cools and freeze them in individual freezer-friendly containers to reheat for lunch or dinner. To Make Ahead and Refrigerate: May be prepped 24 hours in advance before baking. Prepare and refrigerate, tightly wrapping with foil. To bake, cover with foil and bake in a 400F preheated oven in the center rack 50 to 60 minutes. Uncover, add the remaining cup of mozzarella and bake until melted, 5 minutes. Remove from oven and let it rest 15 minutes before serving. 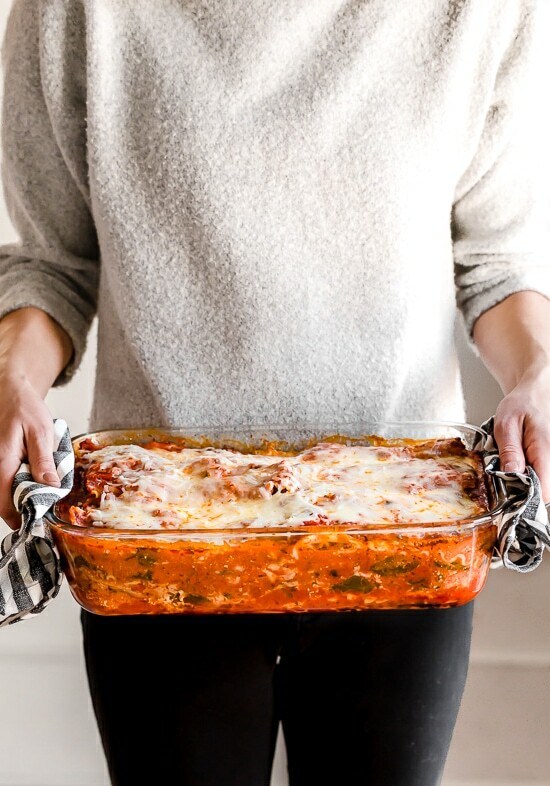 To Freeze and Serve: Prepare unbaked lasagna in a freezer to oven safe Pyrex Deep baking dish, cover tightly with foil and freeze for up to 3 months. Remove from the freezer and let it thaw in the refrigerator 24 hours before baking. To bake, cover with foil and bake in a 400F preheated oven in the center rack 50 to 60 minutes. Uncover, add the remaining cup of mozzarella and bake until melted, 5 minutes. Remove from oven and let it rest 15 minutes before serving. If you wish to simplify this recipe, you can use the breast meat of a rotisserie chicken and shred instead of breading the chicken. It won’t be as high, but it will still be tasty. 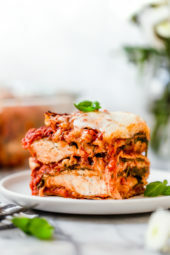 I whipped up my homemade marinara sauce to make this, but you can also use your favorite jarred sauce, you will need two jars. 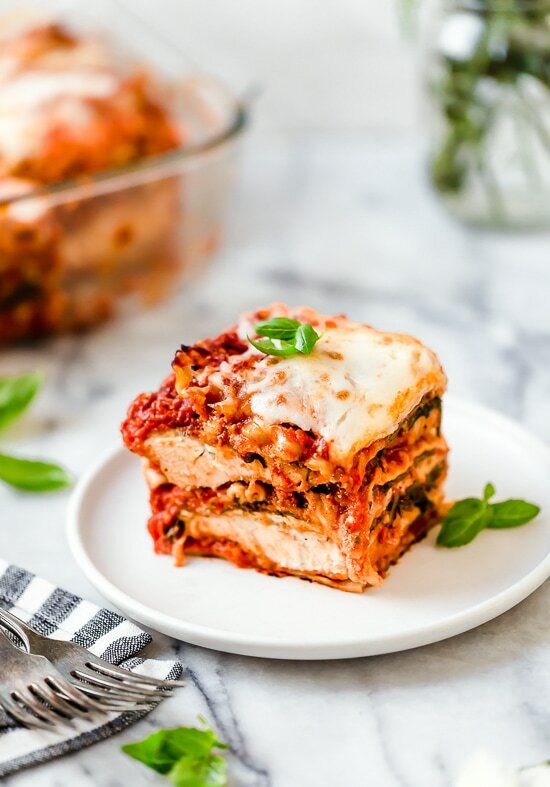 Let’s you add more layers to your favorite recipes to feed a large crowd, so you can have chicken parmesan AND lasagna all in one dish! You can find it at PyrexHome.com and Walmart. Preheat oven to 425°F. Spray a large baking sheet lightly with spray. Combine breadcrumbs and parmesan cheese in a bowl. Beat the egg in another bowl. Dip the chicken into the eggs, then into the breadcrumb mixture. Discard the remaining crumbs. 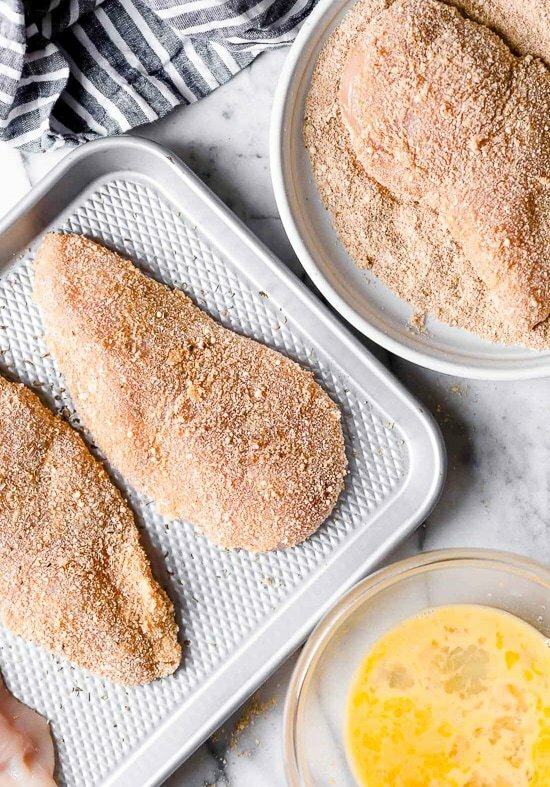 Place the chicken on the prepared baking sheet, lightly spray the top with oil and bake in the oven for 25 minutes, do not turn. When done, remove from the oven and reduce oven temp to 400F. Meanwhile, combine the ricotta, parmesan cheese, and basil in a medium bowl. 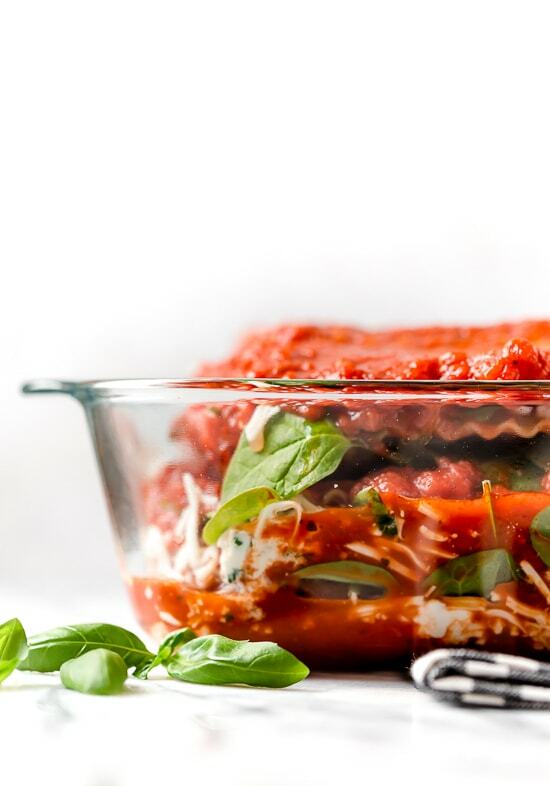 In a 9 x 13 x 3-inch Pyrex Deep baking dish, ladle 3/4 cup of marinara on the bottom of the dish. 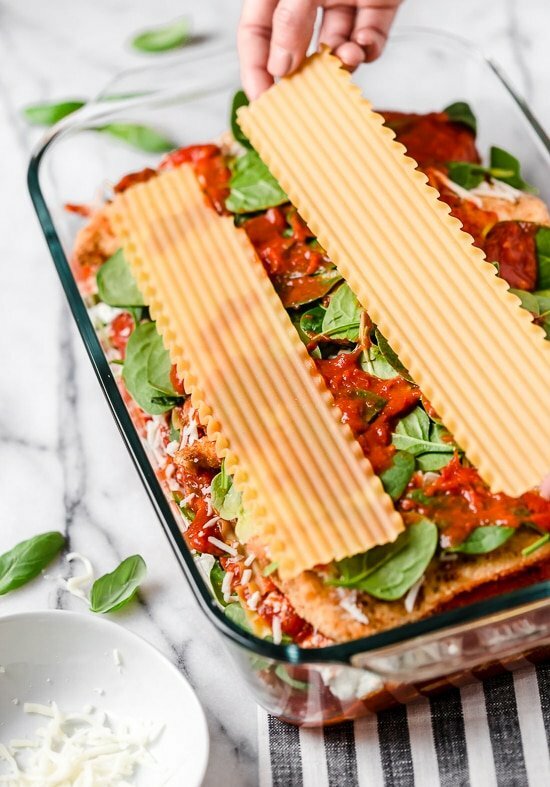 Arrange 3 lasagna noodles across the dish (they will expand as they cook), top with 3/4 cup sauce, 4 pieces of chicken, 1/4 of the ricotta cheese mixture, 1/2 cup mozzarella cheese, 3/4 cup spinach. Repeat the 2nd layer, skipping the chicken. Repeat the 3rd layer with the chicken, and the 4th layer without the chicken. 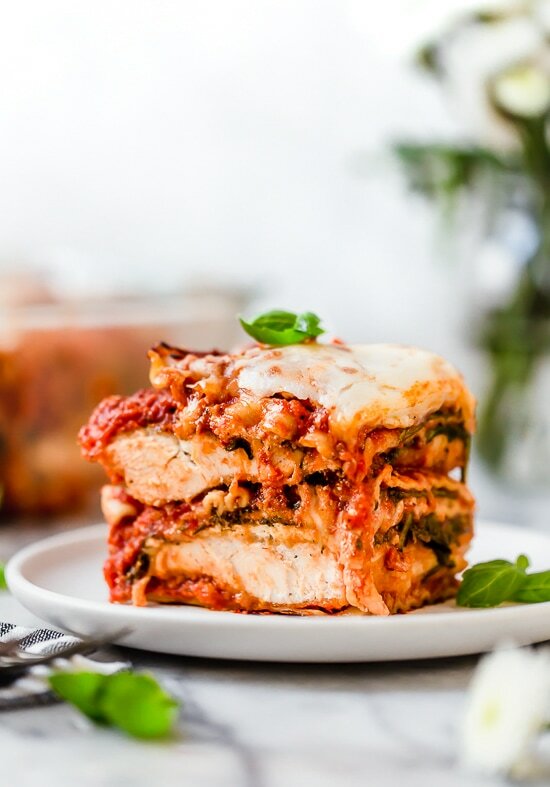 For the 5th layer, spread the last 3 sheets of pasta noodles with the remaining 1 1/2 cups of marinara sauce on top. Cover with foil and bake in a 400F preheated oven in the center rack 50 minutes. 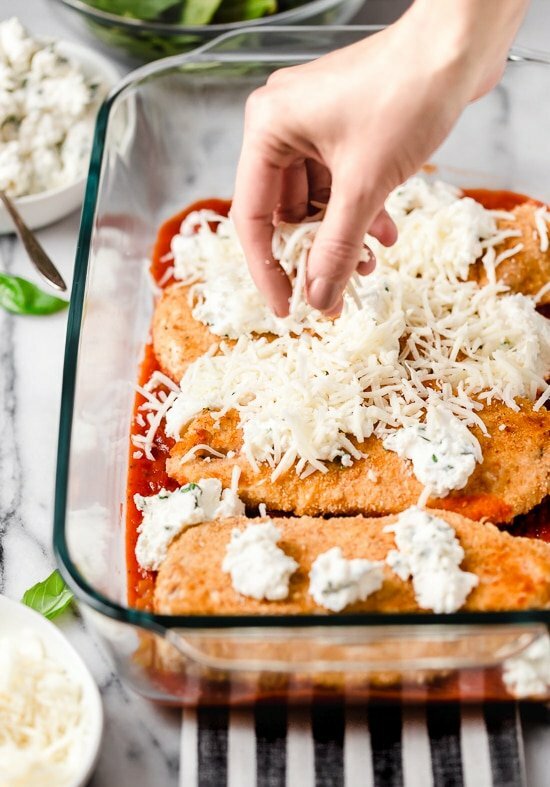 Uncover, add the remaining cup of mozzarella and bake until melted, 5 minutes. Remove from oven and let it rest 15 minutes before serving. Disclosure: This post is sponsored by Pyrex. Thank you for supporting the brands that make Skinnytaste possible. All thoughts are my own.